As a rule, this site is about my own research into the archaeology of the built environment, but I was asked if I could do my bit to aid a new project at Flag Fen; since this is one of the most important sites the country, I am happy to oblige, and I am sure readers may also want to help support this project. I have written about the international importance of sites like Biscupin and Vindolanda, and Flag Fen ranks among these, and now there is an opportunity to get involved, make a contribution, and experience real archaeology. From 23rd July – 12th August, DigVentures [www.digventures.com] are working with Vivacity to create an incredible opportunity for the public to participate in live archaeology. The significance of this site is that it is waterlogged, and this has preserved significant amounts of wood and other organic finds, in particular giving us a glimpse of an ancient built environment, in the form of a timber track way and platform dated by dendrochronology to 1365–967 BC. The full extent and nature of this archaeology has yet to be determined. As I am fond of pointing out, Prehistoric material culture was mostly fabricated from wood and other organic materials like fabrics and leather, things that ordinarily don’t survive. This has resulted in our conceptualising the past in terms of stone and metal tools, rather than the products that they created. Not only do sites like these produce rare examples of material culture, they also give us a glimpse of the woodland economy, an extremely important and often overlooked aspect of native culture. The central theme of my research and this site is the significance of postholes, which although ubiquitous, are frequently disregarded, but at Flag Fen they still have timber posts in and are more difficult to ignore. Each site is an original and unique record of human activity, and my actions as an archaeologist will destroy it, leaving only what I choose to record and recovery for posterity; it is not a surgical operation, not least because there is no human patient, and with due regard to health and safety, nobody will die; it’s just an archaeological dig, and will be resourced accordingly. Give me a JCB and weekend and I’ll do my best, but if want the job done properly it takes money, skill, and the commitment to make it happen. 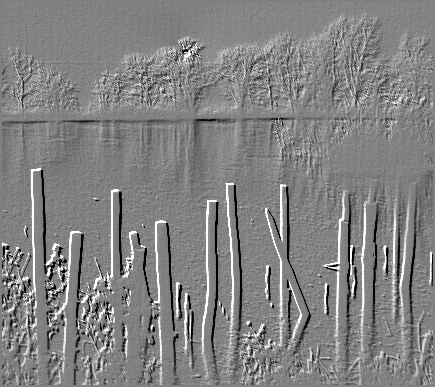 Like great works of art, the ‘value’ of waterlogged sites like Flag Fen lies in their rarity, but also like great art, they tend to be more difficult and, frankly, expensive than conventional archaeology. However, unlike great works of art, this archaeology is not aesthetically pleasing and very messy. From a practical point of view you are working close to or below the local water table, so that the site will usually require constant pumping just to make the archaeology accessible. Archaeology involves the careful differentiation between different ‘contexts’, usually on the basis of small changes of colour or texture of the soil. Working in heavy and sticky wet soil, or mud, as most people would call it, makes the whole process much more difficult. Also, often relatively small artefacts, and other materials have to be located and their relationships with their context carefully recorded. A lot of material may be recovered from soil samples put in bags, to be washed and sieved later. How much of the mud you stick in bags, and what happens to it next is dependent on your resources. There is also more to find, and finding things makes it all much more complicated and time consuming to excavate and record a site. In addition to all the things that you usually find on an excavation, there is extra organic material to deal with. It is general principle that an artefact was probably in a fairly stable condition in its context, but as soon as it is dug up all this changes. A whole new set of chemical and physical processes start acting on it, and the role of the conservator is too establish a new stable environment for the artefact. The process for materials like wood may involve keeping it in a chemical tank, sometimes for years; dealing with the consequences of these rare and important finds may represent a considerable long-term commitment of resources. However, while buried objects may achieve a degree of stability, if the nature of ground around them changes, all bets are off. Archaeology is well enough embedded in the planning process to be able to monitor conventional building and development, but changes in the nature of agriculture have always been potentially more destructive. 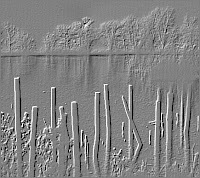 Deeper ploughing, changes of use of agricultural land, coupled with processes soil erosion and changes in the water table and drainage, can obliterate archaeology like Flag Fen. And Flag Fen is just a small corner in an archaeological built environment, the extent of which we can only guess at. Yes, it’s yet another effect of global warming, and the current project will help understand what is happening to this unique archaeological resource, as the land around it dries out. The drought in Southern England may result in the inconvenience of a hosepipe ban, but it could also, unseen and unnoticed, destroy forever one this countries best preserved archaeological sites. Oscar Wilde wrote that a cynic knows the price of everything and the value of nothing, , a sentiment I would extend to many accountants and politicians; the recording, preserving and understanding of the cultures of our ancestors is not everyones top priority, especially in these times of real austerity, however, once sites like Flag Fen are lost, that’s it, they are gone forever, and in the grand scheme of things, archaeology is not that expensive, and provides a significant resource to our tourist industry. 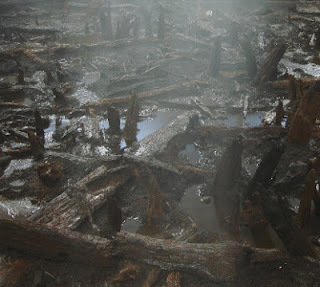 So it’s up to you; do you want to help understand this lost wooden world buried under the drying soil of the fens, it could be an afternoon out, or the start of a lifetime involvement. You can get involved for just £10, and in return for your money, you will be a part of a unique and important archaeological project, and experience a process that most people only glimpse on their televisions. Wilde, O., 1892, Lady Windermere's Fan. [Act III]. 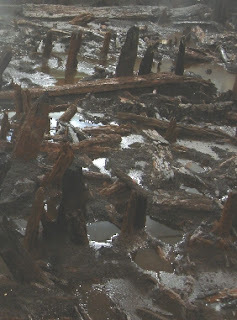 I am writer and have written a short story about early Brits who built a causeway. I am looking for picture of a causeway similar to your photo. If you have one similar to this that you would be willing to grant rights to use it, I would pay you and link to you and your website. My name is Thea Hutcheson and the pen name for the story is Linn Henderson. You can find my work by googling either name. Don't look at Thea Hutcheson at work -- some of the links are adult. If you are not interested, but could point me to a site with pictures similar to yours, especially if they have a full moon in the, that would be superb. I thought you work is very interesting. I began training to be an archaeologist but pregnancy got in the way and my life took a turn. My writing, however, reflects that continuing interest. Thanks for your time. I can be reached at thea at theah dot net.